Electrostatic powder coating involves the use of speciality coloured powdercoating powders, paints and finishes for metal including aluminium and steel to create the final look for the product. It is hugely important to achieve exact colours and textures for our clients to avoid inconsistencies in their branding and to maintain the look and feel of a product. Our team of metal coating specialists work with our powder suppliers to produce coatings in the precise colours required by our clients for their parts and products. As well as colours, we are capable of creating a number of lacquered or coating finishes that include gloss, matt, textured, rippled, semi-gloss etc. Examples of large volume metal parts and products created using our powder coating services include the manufacture of point of sale units and retail fixtures, HVAC systems, electrical enclosures and metal cabinets, along with lighting systems. 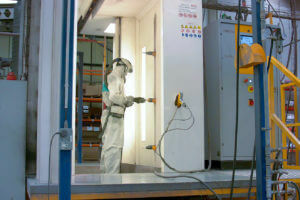 Our 3 Step Guide to Powdercoating a Metal Part or Product! After any cutting, forming or fabrication work has taken place, each item is washed in chemicals to ensure the metal surface is prepared and ready for coating. This is to minimise blemishes and any inconsistencies in the texture of the powder coating once cured and finished. Powdercoating involves six automated reciprocating arms spraying dry powder on to the pre-treated metal item, using an electrostatic charge, in order to gain even coverage. 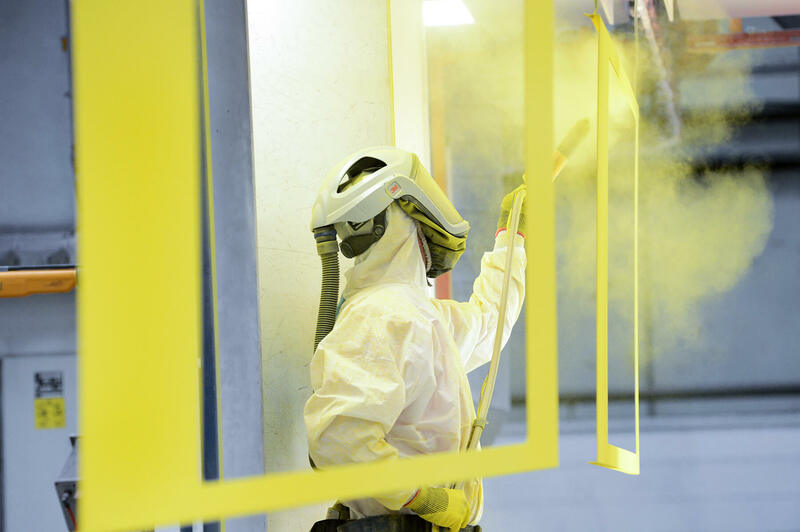 Our highly qualified and experienced powder coating technicians are on hand to inspect each item to ensure that an even coverage is achieved before curing. Once powder coated, the item must then be cured in the curing oven for 15 to 20 minutes, where the 180 degree heat causes a chemical reaction which bonds and finishes the powder coated layer. In need of our Powder Coating services? Our ITW Gema Powder Coater offers unrivalled quality, consistency and flexibility to our UK powder coating services. Being an automated coating line, it features a run rate of two metres per minute and has the ability to change colours in under 10 minutes for maximum productivity. As such, our precision engineering team can ensure that our clients’ deliveries are not compromised by sub-contracted powdercoating operations. Having manufacturing facilities like this on-site at JC Metalworks ensures our place as leaders in the UK metal working and fabrication industry; a position we will keep through our commitment to further inward investment. Our development plans include investing in the necessary equipment to give us small run and prototyping powdercoating capabilities, which will further reinforce JC Metalworks as one of the UK’s leading powdercoating specialists. To find out how we can help manufacture your large volume metal work project, with or without the electrostatic powder coating of aluminium or steel, please use our contact form or call us on 01509 233280 today.